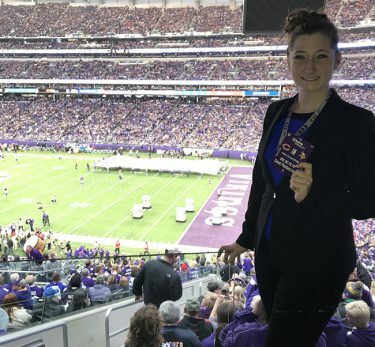 Becca Kamrath was busy over Christmas break working an internship for the Minnesota Vikings. Students working for one of the Grand Canyon University enterprises get great learning experiences. But some can lead to experiences that go to previously unimaginable places. Kamrath’s first day on the job was at a Vikings game. “I was told, ‘These are his guests,’ so that’s all I knew. I said I’ll treat them like everyone else. Mr. Mueller always likes to ask the students, ‘What are you doing? What are your plans?’ So I told everybody I’m from Minnesota and I’m a hospitality management major and have passions for both resorts and hotels but also love sports. “I went through the whole dinner and did my job and let them be, and at the end of the meal this man sitting way down at the end of the table says, ‘Come here, I want to talk to you.’ First of all, he thanked me for my service. He asked if I’m a Vikings fan. I said, yes, I watched the Vikings every Sunday with my dad. I still have no idea who he is. It was the business card for Kevin Warren, Chief Operating Officer of the Vikings and a member of the GCU Hall of Fame. Talk about a good tip. 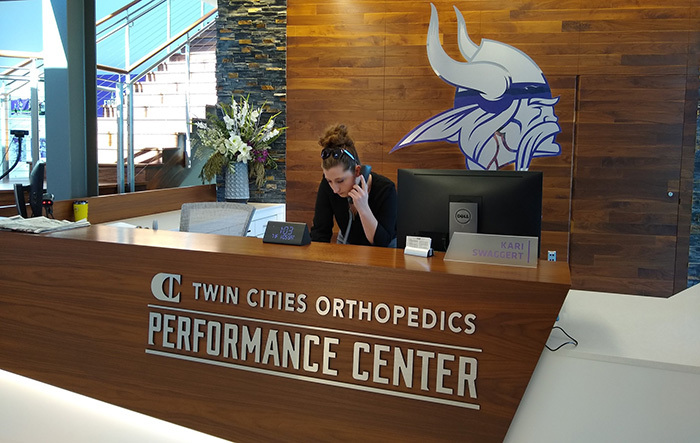 So for three weeks this winter, Kamrath got to work as a Vikings intern in Guest Relations and Event Services. 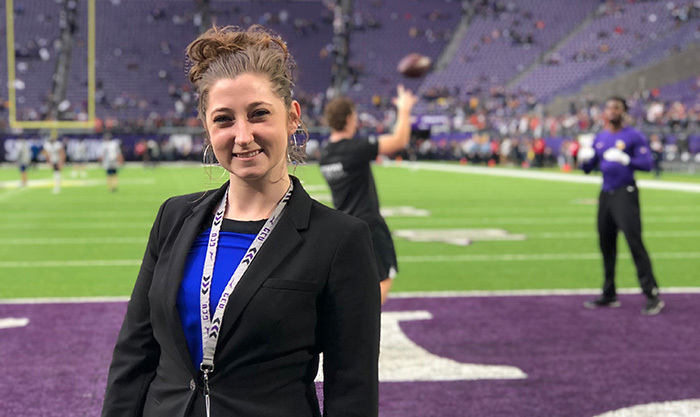 Her very first day on the job was at U.S. Bank Stadium, the posh dome Warren helped build. One of the highlights of the internship was seeing Chief Operating Officer Kevin Warren, a GCU Hall of Famer, at the facility. Soon after, she saw Warren in the cafeteria. He lit up as soon as he saw her and said, “I’m so glad you’re here.” But there was one more big highlight at the end: She got to give her parents a tour of the team’s practice facilities … and they got to meet Warren. It was yet another big GCU-related moment for Kamrath, who grew up in Canby, Minn., 15 minutes by car from the South Dakota border, and transferred to GCU at least partly because, like the Vikings, the Lopes wear purple. Kamrath heard good things about the University when a friend from high school was going to GCU while Becca started her college career in-state. After souring on her first choice, Kamrath decided to come to Phoenix for a Discover GCU Tour … in February … from Minnesota. Think that was a tough sell? Waiting tables at Canyon 49 was an easy decision for Kamrath, who has been doing that type of work since she was 15. “It was my first job in high school and I fell in love with it,” she said. “Tiny pizza place – pizza, sandwiches, salad bar. I figured this out while I was waiting tables: I love meeting new people and hearing what their stories are and where they’re from. Even in a tiny town like that, I would meet people that are passing through and have never been before. Kamrath enjoys serving people, so working in one of the suites on game day was a pleasure. So when the opportunity arose to be student hospitality administrator for GCU Hotel, she jumped at it. Now she looks over labor reports to see how the staff can best be utilized and does scheduling for more than 50 employees. Long term, she’d like to be general manager or regional manager of a hotel or hotel chain. Shorter term, after graduating in April she’d happily work in operations at a resort – in a warm-weather climate. Hey, she’s no dummy. 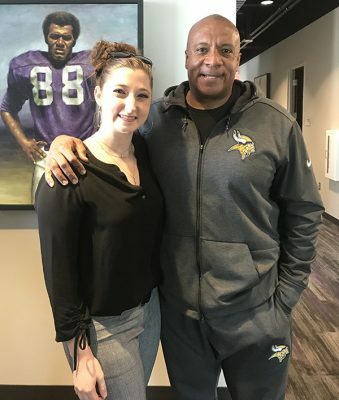 But going back to Minnesota to work for the Vikings in the dead of winter – and still being able to enjoy Christmas with her family – was great, too. 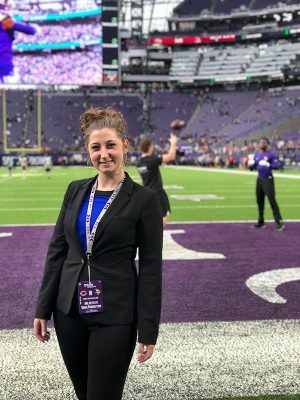 She found the organization’s welcoming spirit to be similar to her GCU experience. And it’s safe to say that, 50 years from now, she’ll still remember how she got her first big internship. The lesson: It’s always a good idea to do your job right … because you never know when a great connection might be sitting right in front of you.